This is myself looking backwards in time, reminiscing the making of me in a boarding school. A great task was at hand for the school faculty to mentor and sharpen the wits of a variety of children from different cultures and different countries in one basket. I too had been saddled in this basket with some becoming good friends for life. Teachers too, of varying nature, but it was a basket of teachers dealing with the inquisitive formative minds . Though all the teachers were great in their fields but I was very much awed by this one teacher, who always sported a smiley face. No student had seen him glum in pressure. This man's name was Brother William alias billie. We students used to tease him, "billie, ye reha chooha," ( cat, here is a rat,) and run away, and he just smiled and laughed it off. This man was one person really #madeofgreat in real sense. No student had been able to anger him by calling names. There was one teacher with bald head and students started calling him Tinda and it so happened that Principal too was seen calling him Tinda on occasions but he used to get infuriated and got so pissed that he left our school one fine day. Billie's smiling face has been a real energizer in my times of stress in present life. I had learnt to forgo petty unimportant things with smile. This was one teacher who gave awards for trying. I remember I had just learnt swimming and took part in race for my house and I came last. This had been my first swimming race and I stood glum having come last but I was overwhelmed when Brother William announced a gold medal for me to have dared to jump in the big deep pool for the first time in life for the sake of house participation. I can never forget that moment in my life, getting an award for at least trying. This was one teacher who had caught me with some friends coming out of cinema hall in Mussoorie . We had bunked classes and this offense was a serious one and could have got us expelled from school but he gave us life by leaving us with warning. Had it been some other teacher, we would have had it that day. I remember when I met him after my marriage, he saw me from afar and came rushing towards me shouting my name. Here I thought he must have forgot as I was meeting him after eight years but he did remember me well. Seeing the mehandi on my hand he understood I had married and first time in my life he scolded me. I listened with my head down but nothing could be undone now as the knot had been tied and he had regained his old self next instant and congratulated me and wished me luck in life. I can say with pride that I had been tutored by Brother William, a real gem and most certainly #madeofgreat. This post has been penned for Tata Motors #madeofgreat campaign. answer as comment on this blog post below in comments section and best comment from all might win you a handsome prize of Amazon voucher worth 750/- rupees. 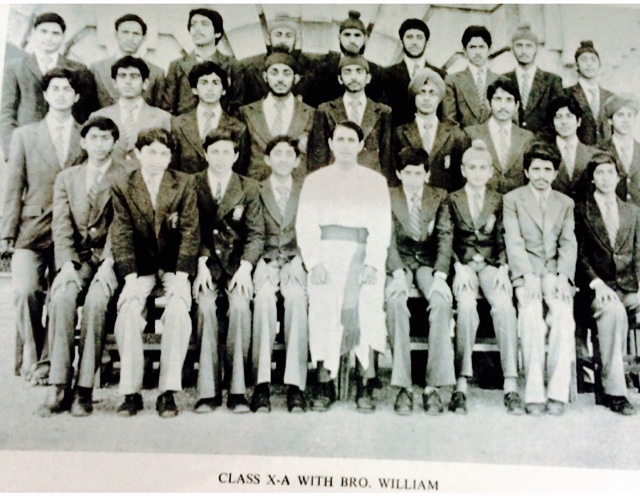 The above picture is of my class in 1980 with brother William. This is a beautiful post on your teacher in real sense with Bro. William. What moved me is the gold medal for trying. This is what every teacher must do. Unfortunately today, we pamper the best and ignore the rest. Everyone is gifted with talent and we only honour academics and leave out others. Else today we might have so many excelling in arts, sports etc. He is the #madeofgreat and I vote for him heartily. Tata motors and Messi association is one that proves to the world that there is life beyond just studies. Messi is one who has proved that live is for living and gone all out to excel in what he pursued. Tata motors by choosing Messi has proved to the world that hard work pays and we honor efforts. Sure to make Indians learn and also be inspired. Thanks Katie. Really privileged I am with your wonderful words. I wish that your teacher must read your write up for him. Wonderfully penned down. Wow, these days it is a bit rare to hear of teachers as wonderful as Brother William. His story (especially the one where he gave you a gold medal for just trying) and attitude towards life in general serves as a source of inspiration for all. I do wish he reads this post. Lionel Messi's association with Tata Motors is bound to give the latter a definite boost. Tata has been a household name in India for years now renowned for its trustworthiness. Messi is a world-famous footballer regarded as one of the greatest ever. His clean track record must have been an important reason why Tata chose him to be their brand ambassador. Together, I think the association will scale new heights and bring glory to the brand of Tata Motors. Good post and nice to read that your teacher was so good ! !